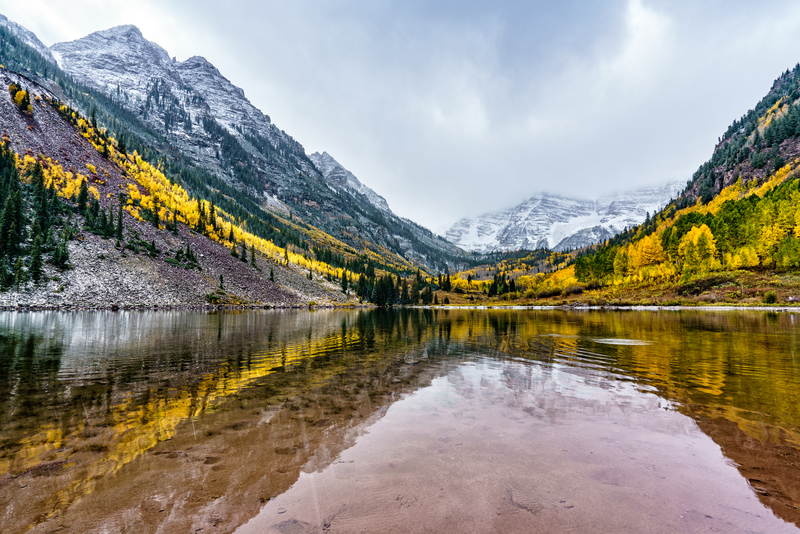 The Maroon Bells are one of the prettiest locations in Colorado, as I saw when I visited four years ago. When I revisited them this past month, the same gorgeous fall colors greeted me, but this time in a sublime juxtaposition with snowfall heralding the coming winter. At first, the accompanying clouds swirling around the lake made the peaks so hard to see I didn't bother trying to take pictures of the Bells. Patience, however, ultimately rewarded me with the view I had sought. Unlike last time, I didn't need to get down on my hands and knees, thanks to the articulating LCD screen of the Sony A7R II camera. I could set the camera down low and tilt the rear screen up to compose my images, which I was especially grateful for this day as I was in no mood to kneel in the mud on the shores of Maroon Lake.